M T D D e c e m b e r 2 0 1 8 82 E u r o p e a n N o t e b o o k I t has been a long time coming, and the speculation around its effect on the European tire market has been speculative and widespread. But finally, the European Union (EU) in Brussels has announced its long awaited "final" decision on the introduction of anti-dumping tariffs to be imposed on truck and bus tires, including retreaded tires, that are imported into the continent from China. Regulation 2018/1579 came into effect on the 23rd of October, and right to the very end the EU kept all concerned guessing -- and even added a surprising final "twist in the tail" in this diplomatic saga. e EU increased the tariff levels almost across the board, which replaced the original retroactive tariffs between February and May of this year. is latest and final ruling means that only Hankook Tire will have its tariff reduced to 42.73 euros (close to $48.53 in U.S. dollars) per tire, whilst other tire manufacturers, including Giti Tire, Aeolus Tire, Guizhou Tyres, Prinx Chengshan Shandong Tire, Qingdao Doublestar Tire, Sailun Jinyu Group, Shandong Hengfeng Rubber, Shandong Huasheng Rubber, Shandong Jinyu Tire, Shandong Linglong, Triangle Tyre and Zhongce Rubber Group, have now been hit with even higher tariffs, from 47.96 euros up to 49.31 euros per tire. e EU has also decided to include the Chinese production facilities of leading global "A" brands, including Michelin (Michelin Shenyang Tire), Bridgestone (Bridgestone Huizhou Tire), Pirelli (ChemChina) and Goodyear (Goodyear Dalian Tire), who also have been handed a tariff of up to 49.31 euros per tire. Finally if all the above tire companies think they have been dealt a really raw deal, then spare a thought for Xingyuan Tire Group and Gaungrao Xinhongyuan Tyre, who have been hit with a massive tariff of 61.76 euros per tire. is confrontation with the import of Chinese manufactured tires into Europe and, indeed, other countries around the world has been going on for more than 18 months, and this final ruling has predictably bought the sale of Chinese imported truck and bus tires in Europe to an almost complete halt as the tariffs imposed on the tires have made them so expensive and therefore completely unprofitable. European tire wholesalers have been preparing for the possibility of tariffs being imposed throughout this year and trying to source out appropriate manufacturers producing in Europe or outside of China, with ailand suddenly becoming a new "hotbed" of tire production. However both in Europe and in some parts of Asia, tire production facilities have really struggled to cope with the additional demand for tires, which has inevitably led to a shortage of truck and bus tires. is dramatic slowdown in tire production has had an immensely negative effect on the commercial tire market in every European country, and I have noticed that almost overnight advertisements in European magazines, both hard copy and digital, for commercial tires have disappeared. I have also spoken with the European distributors of several Chinese truck and bus tire manufacturers, and the general opinion is the ruling has effectively "killed off " most business in Europe in this market sector, at least for the moment. It seems small commercial tires have now become totally unrealistic in price, and larger tires are not far behind. One distributor (who shall remain nameless) points out that affected Chinese producers are now frantically trying to divert production for Europe to their facilities outside of China, which are mainly in Indonesia, ailand and Vietnam. And cranking up production levels takes time. Another significant development has been the responsive action of the "A" brand manufacturers, which have instantly switched their production to second line brands that are manufactured outside of China. ese tires are now being targeted by major European tire wholesalers as they are the cheapest alternative at the moment. It is still too early to get a true measure of the real impact of the tariffs, but it is estimated that in the last few months, Chinese imports have decreased by 88% per month, which as I mentioned earlier has pretty much stopped this market dead. It will be very interesting to see what happens next. Will the Chinese producers dodge around the tariffs by making their tires in other countries and stage a comeback in the market? Will China subsidize Chinese-based tire manufacturers to get around the tariffs? Watch this space! 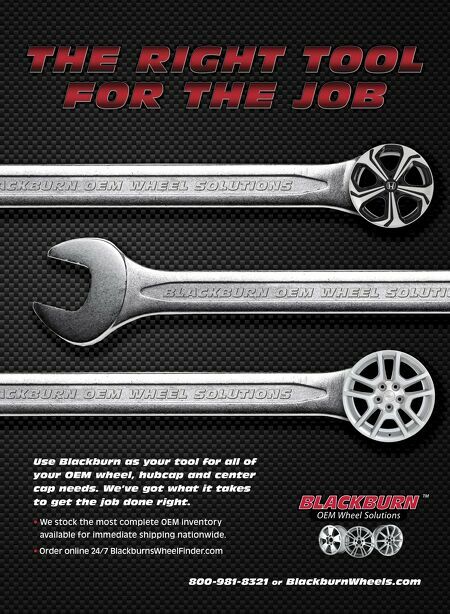 ■ John Stone has been working within the global tire industry for the past 27 years. In 2004 he launched his own consulting company, Sapphire Media Service, which caters to business media clients around the globe. Stone also writes for tire and automotive-related publications in Europe, South Africa and Asia. 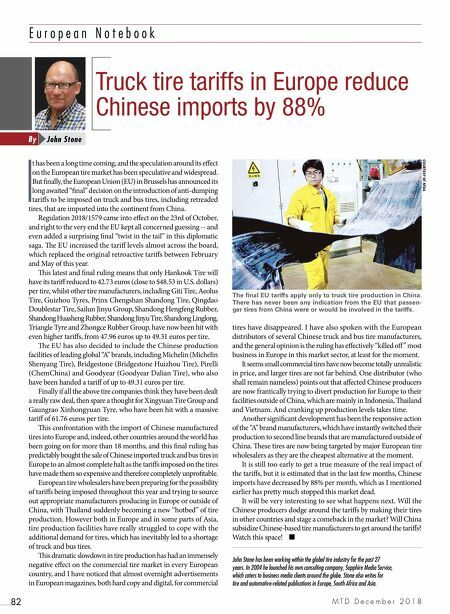 COURTESY OF NTDA Truck tire tariffs in Europe reduce Chinese imports by 88% John Stone By The final EU tariffs apply only to truck tire production in China. There has never been any indication from the EU that passen- ger tires from China were or would be involved in the tariffs.